Can The Bacon Press Iron Out Your Love Life? My husband was not alone in his quest to dine at this establishment. The eatery seemed to cast a hypnotic spell over every male within a one-mile radius. Men marched into the entrance much like the children of Hamelin marched to the Pied Piper. I admit it; I was intrigued. A little aside here: If anyone is looking to meet a man, this is the place to go. Not only were men present, but they had no interest in planning a mad dash or escape. When the owner asked a table of four males what brought them to his humble restaurant, one of the diners responded, “You had bacon on your sign. We had to come.” Who knew that attracting men could be so simple. One has to wonder why they don’t make bacon perfume. Or do they? Anyway, a bacon-themed restaurant would provide more success for meet ups than Match.com, eHarmony and AshleyMadison.com combined. Maybe, dating sites and The Bacon Press could form some type of romance joint venture which would give new meaning to the old saying spouted by many a spurned woman: men are pigs. Anyway, back to the restaurant. Being the intrepid reporter I am, I couldn’t help but eavesdrop on some of the conversations of the lunchtime crowd who drooled over the menu. Finally, he chose the bacon mac ‘n cheese with jalapeno peppers which I admit looked and tasted amazing. The other diners’ selections looked equally impressive from my vantage point. There was one odd thing about this restaurant. It was almost like a church. Conversations barely edged above a whisper. Customers ate with the same reverence some would show when praying. They were enamored with their food. So, while The Bacon Press might be a great place to meet men, it’s probably not a great place to engage in conversation with men unless, of course, you speak Pig Latin! Get it? I’m sorry. I couldn’t resist that one. For the record, I swooned over my peanut butter and jelly French toast, so the fault of no-conversation was mine to share. 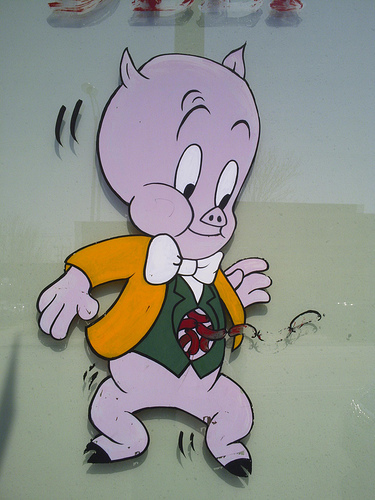 If Porky Pig ran for King of the World, he would win in a landslide, but he better beware of what they serve at his inaugural ball. Donna Cavanagh is founder of HumorOutcasts.com (HO) and the partner publishing company, HumorOutcasts Press which now includes the labels Shorehouse Books and Corner Office Books (HOPress-Shorehousebooks.com). As "den mother" to the more than 100 aspiring and accomplished writers, producers, comics and authors, Cavanagh's goal is to allow creativity to flow. She is a former journalist who made an unscheduled stop into humor more than 20 years ago. Her syndicated columns helped her gain a national audience when her work landed in the pages of First Magazine and USA Today. She teaches the how-to lessons of humor and publishing at conferences and workshops throughout the country including The Philadelphia Writers' Conference and Erma Bombeck Writers Workshop. The author of four humor books, Cavanagh hopes her latest book, How to Write and Share Humor: Techniques to Tickle Funny Bones and Win Fans, will encourage writers not only to embrace their humor talents but show them off as well. 10 Responses to Can The Bacon Press Iron Out Your Love Life? I’ve never wanted to visit your side of the pond so much Don Don’s! 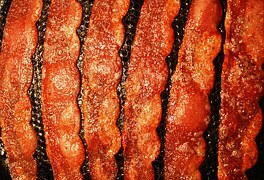 When I think of bacon, I think of clogged arteries and and overdose of calories. But, the Bacon Press sounds like it could soon be a chain! And your husband is missing out, if he is more interested in a menu than the brilliantly penned words you write! My wife loves bacon, so there need be no more question about why I married her. Are Donna and I the only two people in the world who can take bacon or leave it? It isn’t just men, either. I actually know WOMEN who really like the stuff. As for me, unless it’s in a BLT sandwich, I don’t want it, and I probably eat a BLT once every five years or so! Give us this day our daily bacon. Amen. HA HA! And now I think it might have closed its doors. I knew I should have posted this earlier. I feel responsible for its demise. I am in a happy place just knowing this place exists. I can’t believe it. I went to church and they announced a male fellowship event and the minister said, “One word, guys. Bacon. All the bacon you can eat.” That was it, and I’m sure it was a SRO event. Wow. Your column adds weight to this phenomenon. Suzette, men have a weird fascination with the stuff. Go figure.